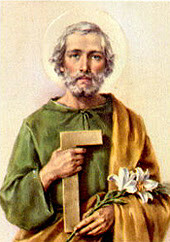 Today, we are beginning the month of May with a liturgical memorial very dear to the Christian people: that of St Joseph the Worker; and you know that my name is Joseph. Exactly 50 years ago it was established by Pope Pius XII of venerable memory to highlight the importance of work and of the presence of Christ and the Church in the working world. It is also necessary to witness in contemporary society to the "Gospel of work", of which John Paul II spoke in his Encyclical Laborem Exercens. I hope that work will be available, especially for young people, and that working conditions may be ever more respectful of the dignity of the human person. I am thinking with affection of all workers and I greet those gathered in St Peter's Square who belong to many associations. In particular, I greet the friends of the Christian Associations of Italian Workers, who this year are celebrating the 60th anniversary of their foundation. I hope that they will continue to live their choice of "Christian brotherhood" as a value to embody in the field of work and of social life, so that solidarity, justice and peace may be the pillars on which to build the unity of the human family.